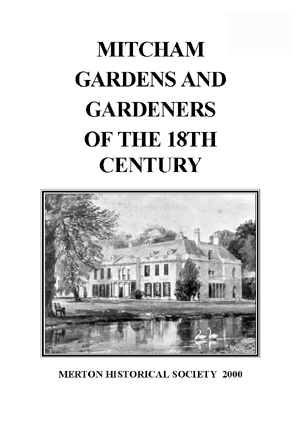 In Mitcham Gardens the author explores the surprisingly rich history of 18th-century horticulture in Mitcham, manifested by plantations, shrubberies, walled gardens, glasshouses and gravel walks, as local gentlemen vied with each other in this fashionable craze. ‘Mitcham Grove, in Surrey, the Seat of Henry Hoare Esq. passed to James Moore, his 30-year-old nephew. major industry in the parish during the first half of the following century. was more likely than not to be the residence of the bailiff or steward. could be traced back to the landowners of the 17th and 18th centuries. prestige it was felt to convey. gardens, arbours and mazes beloved of the Elizabethans. established in his garden to the south of Fair Green. serving in this capacity from 1702 until 1737. Mitcham Common and the surrounding countryside. the linear park between the Watermeads housing estate and the Wandle. overlooking the pond at The Canons. kinds began to arrive in this country, and the collector gardener appeared. The house and gardens of Peter de St Eloy at Colliers Wood, depicted in J.
garden design, with avenues and fair prospects, took root in England. but already becoming commonplace in the gardens of the larger houses. the site of the Arbuthnots’ house, and must be roughly 200 years old. probably planted soon after the house was built in 1791.
borers, who required timber of smaller diameter. Wimbledon estate there was a noted fig walk, planted in the 16th century. grounds of Wandle Villa, Phipps Bridge. Playing Fields, behind numbers 482-484 London Road. informality and carefully placed classical temples. improvement to excite the great Brown’s interest. by Richard Garth in 1768.
peace and beauty of the setting. Mitcham Grove, in Surrey, the Seat of Henry Hoare Esq. the beauty of the place”. to supply water for domestic and even firefighting purposes. the Wandle south of Merton bridge. suitable feelings of sentiment and melancholy. local examples, although again not of the 18th century. Cropped and Planted … and Clothed with Fruit Trees, to Great Perfection”. and The Canons leisure centre. principal of a London firm of merchants, with offices in Copthall Court. the area now covered by the houses of Baron Grove and Mitcham Park. ‘Mr Tipple’s House, Mitcham’ [later known as the Manor House]. Watercolour by Gideon Yates, dated 1825. (Surrey Archaeological Society). Note the use of cold frames and cloches. researched in about 1789 and first published a year or so afterwards. later sale particulars to have been the kitchen gardens and a meadow. designers were seeking to achieve by the application of art to nature. and was “sheltered against the road by remarkable large elm trees”. elm trees, and bounded on the east and south by Mitcham Common”. across open heathland to Pollards Hill and the North Downs. This entry was posted in Publications, Booklets, Publications and tagged in georgian mitcham, late georgian mitcham, mitcham.